Up to 50% Off in the Spring Sale at Evans Update your style in time for Spring and get up to 50% off at Evans! 10% Student Discount at Evans Shop online at Evans today for big discounts when you use your Student Beans ID! Free Next Day Delivery on Orders Over £50 at Evans Get your order delivered the very next day for free when you spend over £50 at Evans! Up to 50% Off Holiday Shop Orders at Evans Get beach ready with up to 50% off in the Spring Sale at Evans! New Arrivals from £5 at Evans Shop the newest styles at Evans starting from £5! Free Delivery on Orders Over £50 at Evans Don't worry about delivery fees when you're spending big at Evans! Up to 50% Off Shoes in the Spring Sale at Evans Step up your style game in time for Spring with up to 50% off at Evans! Up to £60 Off Coats and Jackets in the Spring Sale at Evans Spring may be on its way but that doesn't always mean it's time to ditch the Winter coat! Shop the sale at Evans and get up to £60 off! 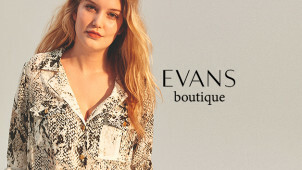 Up to 50% Off Tops in the Spring Sale at Evans Shop tops at Evans and get up to 50% off! Founded in 1930, Evans has been around for a very long time, but by partnering with plus size models, celebrities and designers, Evans has stayed on trend and supplies looks to suit plus size women of all ages and for all occasions. The brand has been fronted by such stars as Dawn French and Crystal Renn in the past, and aims to provide styles that flaunt and flatter in all the right places so their customers can look and feel great whatever their size. As well as attractive party wear, office wear and casual clothing like jeans and jackets, Evans is a great go-to store for plus size swimwear, lingerie and sleepwear, and also has accessory collections to complement your favourite Evans outfits. With great brands under the Evans banner like Curvy Kate, Gemma Collins, Sloggi, Gossard and Live Unlimited, you'll find plenty to love whether you shop online or visit your nearest branch location. How do I use my Evans discount code? Click ‘Continue securely’ to complete the payment process as normal, enjoying great fashion savings from vouchercloud! Sign up to Evans with your email address and you'll get a fabulous 20% your first order! Do check any Terms that may apply. Does Evans offer free delivery? To save more money on your order, choose the free and convenient 'standard collect from store' delivery option. Your purchase will arrive at your chosen Evans clothing store in 3 to 7 working days at no charge! Delivery is also free on orders over £50, see here for more details. Where is my nearest Evans store? Evans have branches all over the UK, and you can quickly find those nearest to you using their store locator. What are the measurements for Evans sizes? If you would like to order online with Evans but aren't sure which size you need, they offer a handy online size guide to help you decide. Additionally, you can also use their useful style guide to help you pick styles from their current range to suit your figure (and calculate what kind of body shape you have if you're not sure). Can I buy Gift Cards for Evans? Evans offer gift cards in a number of ways. You can buy a card in store in an attractive wallet, you can order a physical gift card to be sent by mail either to you or the recipient, you can buy an e-gift card which will be sent to the recipient of your choice by email instantly, or you can buy a printable gift voucher you can print off and give yourself however you wish. Does Evans do student discount? Not at the moment, but keep your eyes peeled on vouchercloud to see if anything changes. Check out its style section too for some great deals on many of its pieces. You have 14 days to change your mind to return your item via post. Customers outside of the 14-day policy may return their order within 30 days to an Evans store to receive a refund or exchange. UK Customers - 0344 984 0262 (Calls to 03 numbers cost no more than a national rate call). UK Bank Holidays: 9am to 5:30pm. Evans is the trusted UK plus size clothing brand for women, and with regular offers available here at vouchercloud you can get more fashion for less. Use an Evans discount code from us for your summer wardrobe essentials including patterned maxis and well fitted tunic tops. While other names in women’s fashion are moving slowly into the plus size market and providing larger sizes in their core ranges, Evans has been designing and producing stylish clothing in UK sizes 14-32 for decades. Shop online, and find gorgeous outfits that make you feel fashionable day in and day out. Evans worked in partnership with high end couture label Clements Ribeiro to create a special line of exclusive clothing called Swan at Evans back in 2012. Plus size superstar singer Adele apparently loved the Swan range so much she bought the entire collection, and wore one of the dresses on stage for a live concert in Canada. Evans have also partnered with other designers and celebrities to create interesting, trend-conscious ranges aimed at younger women, for instance, a range designed in collaboration with Beth Ditto in 2009, which was universally acclaimed. As well as making clothing and lingerie in attractive, on-trend styles for plus size women, Evans also has a great selection of shoes with extra wide fittings and boots with more room in the ankles and calf areas. What’s more, when you shop with Evans voucher codes you can find footwear you love at a better price! This means that whatever your shoe size and leg shape Evans will have the perfect footwear for you within their range.